Q. 6. How involved have you been in the development of your books? Do you have input into the cover/illustrations? Q. 9.What do you wish you’d been told before you set out to become an author? Recent books for older children include “The Youngest Cameleer’ - how Moslem Cameleers helped find Uluru, ‘My Holocaust Story: Hanna’, now published in Canada and the sci fi ‘Cybertricks’ which won a 2016 Notable. Other recent novels for young adults include ‘That Stranger Next Door’, and ‘In Hades: a verse novel’ short listed in 2015 for an Aurealis Award. She speaks in schools, tertiary and community centres, festivals and also run classes in creative and memoir writing for adults as “Mentoring Your Memoir”. Sales sites: www.fivesenseseducation.com.au and all good book stores. Today we welcome C.M. 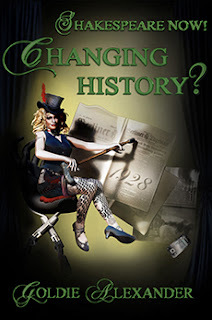 Simpson to Promote Me Please to talk about her story, Destiny's Queen. Q.I. 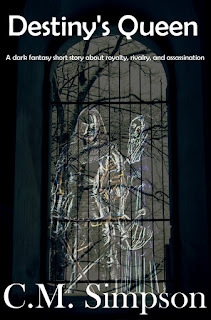 Destiny’s Queen is a short story. Who or what is the queen? A.1. The queen is a real queen. She is ruling alone, and has no partner, an issue she knows she must address if she is to keep her kingdom intact. Q.2. Which do you prefer writing; shorts or longs? A.2. Is it bad to say that I like to write ALL the things? Short, super short, or extra long, I just like to write stories. Q.3. When writing Destiny’s Queen, did you know the ending before you got there? A.3. No. 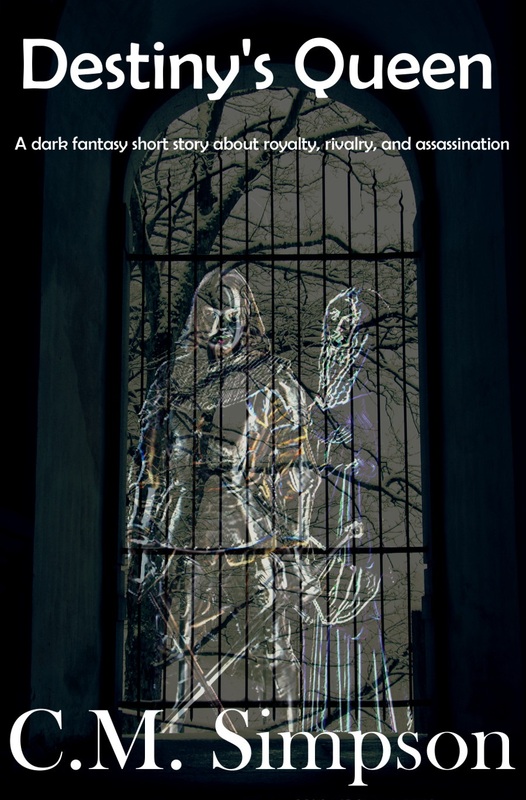 I was experimenting with a writing approach called Writing into the Dark. It’s where you sit down, and basically say “I’m going to write a story”, and then you start typing with the first word or sentence that pops into your head, and you continue to type until you get to the end. Sometimes the endings surprise me. Q.4. In 25 or fewer words, what is Destiny’s Queen about? A.4. A queen must marry to make an alliance, but her dream prince is dead, assassins are coming, war threatens, and deception is rife. Q.5. How did you come up with the title for Destiny’s Queen? A.5 It just seemed to fit the tale, given the story was about how life takes unexpected turns and a chain of coincidences can lead to something that could only ever have been meant. Promote Me Please is a blog run by Affordable Manuscript Assessments, dedicated to spreading the word about new general-exhibition books and music. Today we welcome Carlie Simonsen to Promote Me Please to talk about the last two books in her Letters Across Space series. Carlie Simonsen is the pen name used by C.M. Simpson so that her YA fiction doesn’t get mixed up with the science fiction novels she writes for an older audience. Q.1. 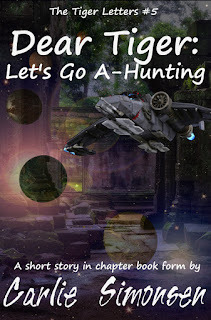 Dear Tiger: Let’s Go A-Hunting is an intriguing title. Would you tell us who, or what Dear Tiger might be? A.1. Tiger is the sixteen-year-old boy on the other end of the main character’s emails and letters. He’s a bit of a whiz with computers and a genius, but that doesn’t stop him from getting into trouble. He also writes back. Q.2. 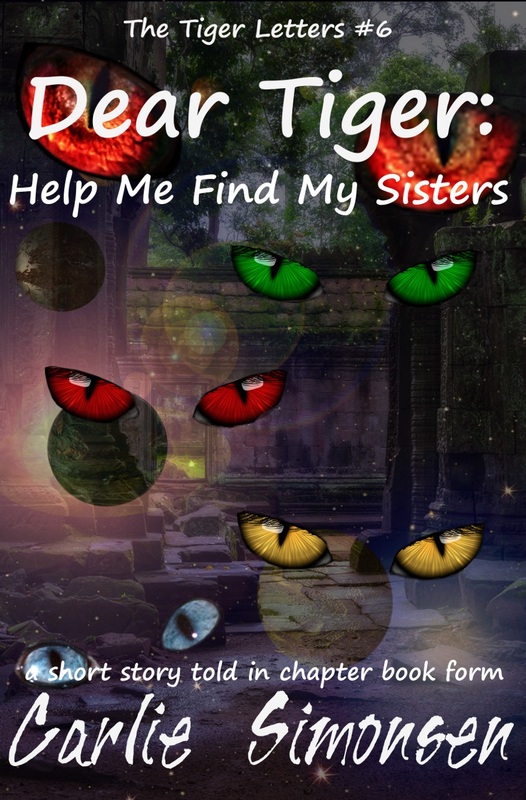 The title of Dear Tiger: Help Me Find My Sisters suggests the story is told in the first person. Who is the narrator? A.2. The narrator is Simone, a sixteen-year-old girl, and the daughter of a scientists who are part of a space exploration team. Unfortunately, Simone received a package containing some alien slime moulds that turned out to be mutagenic, and was infected when she opened it. Now, she’s having to deal with the changes. Q.3. 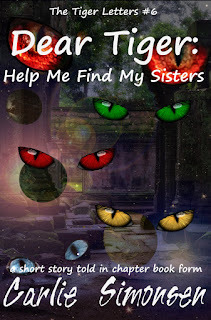 Are the sisters in Dear Tiger: Help Me Find My Sisters literal sisters or figurative? Q.4. These books follow another one in the same series. Do the three volumes tell a single story as a serial? A.4. There are six volume in the series. They can be read as stand-alone, but are better read as a serial as each ends in a way that leads to more questions. Because of that, I’ll be incorporating them into a single volume, so they can be read in one sitting, if that’s what a reader prefers. Q.5. Describe the ideal reader for the Dear Tiger series. A.5. Ooh, that’s a hard one. I guess the ideal reader would be someone who enjoyed science fiction with a touch of horror, a little bit of action and adventure, and just the tiniest hint of romance – as the two characters try to reach the same location. It would also be someone who enjoyed reading about aliens, planetary exploration. That reader could be a girl or a boy, and I think the age could range from around twelve through to adults. Now... here are some handy links. Promote Me Please is a blog run by Affordable Manuscript Assessments and dedicated to spreading the word about family friendly books and music. 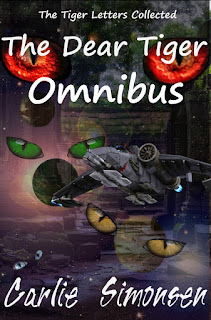 Today we welcome Carlie Simonsen to Promote Me Please to talk about the last book in her Otherworld Adventures series. Carlie Simonsen is the pen name used by C.M. Simpson so that her YA fiction doesn’t get mixed up with the science fiction novels she writes for an older audience. Q.1. Rocky and the Raptors sounds like a band name. Is this right? If so, please tell us about it. If not, who are Rocky and the Raptors? Would you tell us who, or what Rocky might be? A.1. It’s not a band name. 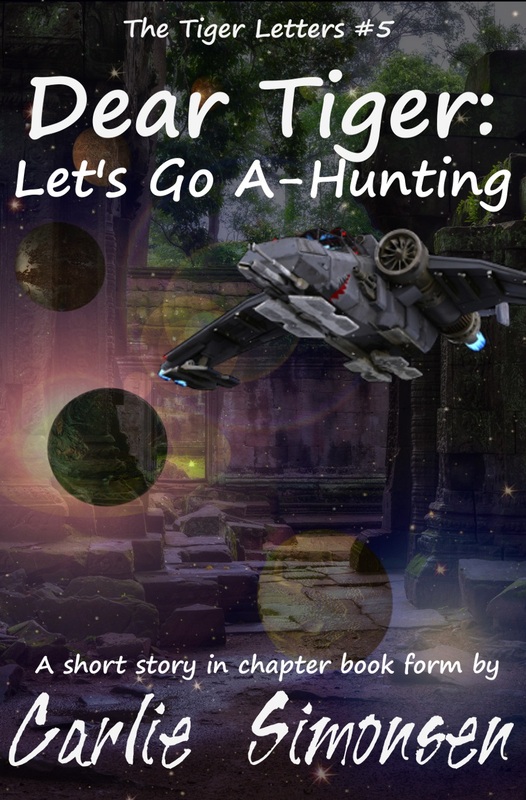 The story is about Rocky, a young boy from outback Australia, who has journeyed across space with his family in order to help some aliens with their colony. Raptors are found on the planet, and the colony is surrounded by a high wall, that it extends as it expands, clearing each new area of raptors, first. Q.2. Who is your favourite character in Rocky and the Raptors? A.2. I’m torn. I like Rocky, but it’s his little sister and her teddy bear that make me smile. A.3. Aaagh! Too much pressure! Fine. When Rosie’s teddybear is stolen by a bird, Rocky has to go beyond the colony walls to get it back. The first problem is that raptors live and hunt beyond the wall, and Teddy might be hard to find. The second problem? If Rocky doesn’t go looking for Teddy, Rosie just might—and Rocky likes his little sister, even if she is a massive pain! 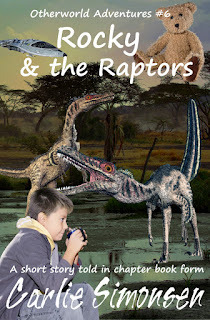 The story follows Rocky as he sneaks out into raptor territory to fetch his little sister’s teddy bear and bring it back, before she tries to go fetch it herself. A.4. Rocky and the Raptors is more traditional than Dear Tiger. It’s also for a slightly younger audience. For this series, I chose third person narration. Q.5. If Rocky and the Raptors was a film, who would play Rocky? A.5. Oh, wow – that’s tricky, but mostly because I’m fond of Pixar. Let me do a little research… Nope, still no luck. The person who played Rocky would have to be a male actor around ten to twelve, maybe even thirteen. After that, I’d say it’s up to the director and casting, because how I imagine Rocky won’t be how others do. For instance, while I see Rocky as having short hair, that doesn’t have to be the case, and, while I’ve pictured him as European in descent, that’s just because that’s been the nationality of most of the station families I’ve met, and that doesn’t have to be so, either. Really, a Rocky and the Raptors movie could put any physically active male actor in that role, provided they looked the right age, could ride a horse, and looked like the kind of person brave enough to make friends with aliens, and brave and caring enough to look after their little sister down to rescuing her teddybear and sewing him up when they found him. Promote Me Please blog is dedicated to spreading the word about family friendly books and music. It is run by Affordable Manuscript Assessments. Today we welcome C.M. 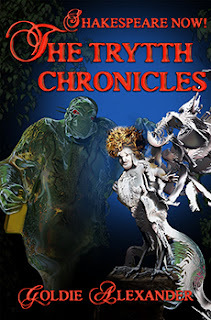 Simpson to Promote Me Please to answer five questions about Dreams of the Serpent . Q.I. Serpents appear in the mythologies of numerous cultures. What does the one in Dreams of the Serpent symbolise? Q.2. 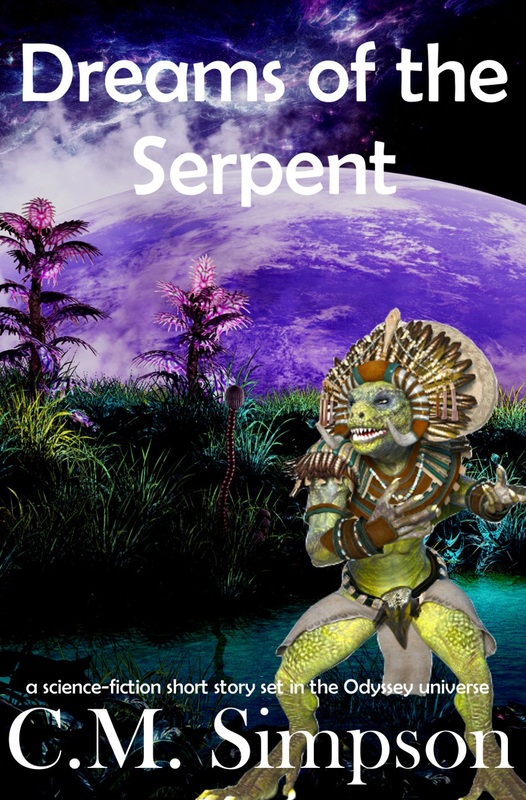 Tell us about the protagonist of Dreams of the Serpent. A.2. 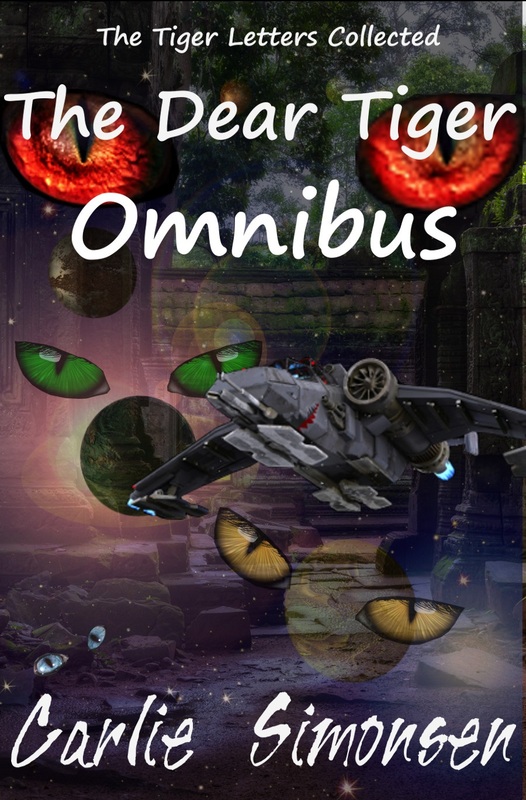 The protagonist has been sent to broker a peace with an alien race, but doesn’t want to stay there. 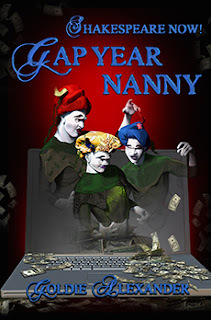 She has dreams, and must face a difficult choice to fulfil her company obligations or do what she most wants. She is strong-willed and determined, and not some damsel waiting for rescue. Q.3. Do you deliberately use themes in your writing, or do you find they insert themselves? A.3. I never deliberately choose a theme, but I always find them, either as I write, or when I’m editing. It’s funny how the subconscious works. Q.4. What do you enjoy most about writing? Plot, character, theme or style? A.4. Story. I like the story, so I guess I like the plot, but plot alone isn’t story, you need characters to make to it live. Theme and style are just elements that carry the story and portray character, but plot and character are the story itself, and those are my favourite parts. Q.5. Did you write Dreams of the Serpent in response to a particular idea or incident? If so, what was it? A.5 If I recall correctly, I used an Excel spreadsheet listing parts of titles to randomly roll the first and second half of a title, and I wrote from there. Reading back over it, I see it again has a theme of workplace loyalty, dreams and choices, and that may have been because I was coming to a crossroads in life, where I had finished one part of the journey (my degree), and had to choose the next trail to follow. Whatever the influence was, I didn’t consciously choose to put it in the story. Today we welcome Judy & Keith to Promote Me Please to talk about Let's Jam. As usual, I asked five questions and here are the answers. Q.1. Let's Jam is an intriguing title. Is it a direct quote from the book and if so, who says it? 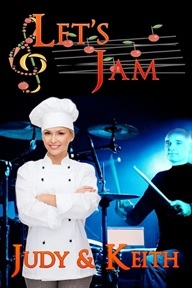 ‘Let’s Jam’ is a play on words and merges two worlds—culinary arts and musicians. It is used towards the end of the story as the name for a chain of restaurants. Simon (the drummer) suggests it to Lacy (the chef). Q.2. Who is your favourite character from Let’s Jam? The story is basically a young adult romance between Lacy and Simon. It’s difficult to choose between the two characters, but if forced, it would be Lacy. Q.3. I see from the blurb this story has a rocker and a chef. Tell me about one piece of research you did for these characters. All adapted from personal experience…we have multiple rockers and chefs in our extended family and have hosted many groups, some extremely successful, in our converted garage-slash-recording studio. 4.Q.4. Okay, let’s play the- If-you-like-this-book-you-will-like-Let’s Jam game. Can you give me a title? Q.5. Three words to describe Let’s Jam please? S Sounds a lot of fun... to read more about Let's Jam or to buy the ebook, visit the links below. Q.1. 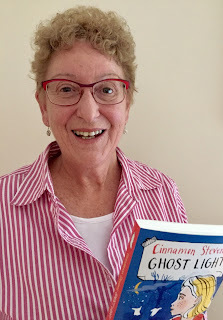 Cinnamon Stevens – Ghost Light is an intriguing title. Can you give us an elevator pitch? A.1. 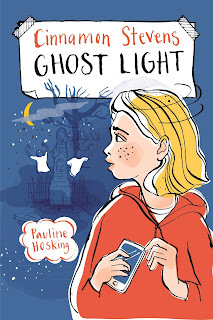 To stop one of her besties being bullied, Cinnamon must discover what really happened in the out-of-bounds cemetery at night and solve the mystery of a haunted theatre. A “ghost-light” is the light is left on in an empty theatre so the theatre ghost doesn’t feel forgotten. It’s one of the many theatrical superstitions mentioned in the book. Q.2. 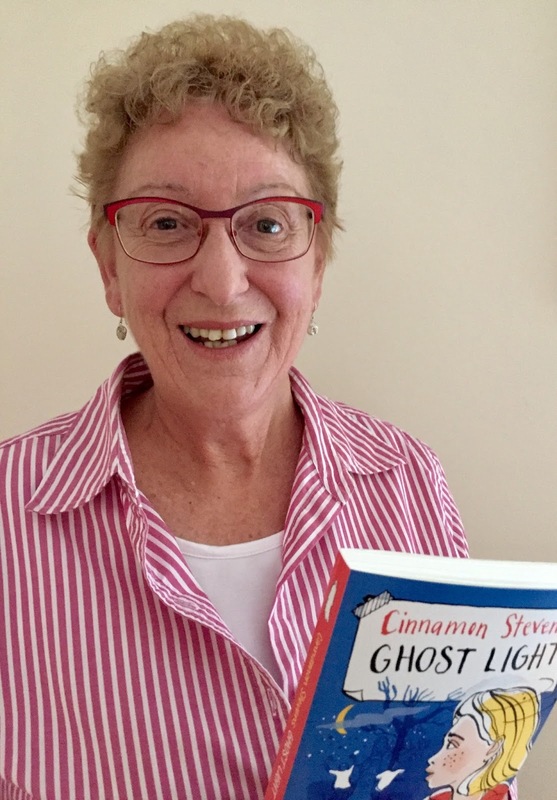 Cinnamon Stevens – Ghost Light is a sequel to Cinnamon Stevens – Crime Buster. How has Cinnamon changed since the events of the last book? Q.3. Please describe Cinnamon Stevens in five words. A.3. Funny. Feisty. Tenacious. Caring. Strong. Q.4. Give us five more words to describe the Cinnamon Stevens series. A.4. Real-life. Real locations. Crimes. Clues. Q.5. If Cinnamon Stevens could have her choice of any other fictional detective to work with on a case, who would she choose? A.5. Commander Samuel Vines of the Ankh-Morpork City Watch who features in the Discworld novels by Terry Pratchett. Sam is tough but fair, clever and kind. His men worship him and he sorts out criminals without fear or favour. He likes sleuthing at night. Cinnamon doesn’t like the dark, so she would feel safe working with him. And learn a lot! For more information about books, workshops and all things Cinnamon... visit Pauline's website.